Swans fans are in the North West corner of the top tier on the far side of the Sir John Hall Stand. It’s a climb of 14 flights of stairs and you’re mega far from the pitch. Anyone who is scared of heights – beware; also binoculars may be an idea. Leg room and height between rows are similar to the Liberty and the facilities are pretty good. The concourse is big with a fair choice of pies, with burgers and hot dogs. There are TVs, showing the game being played, with separate refreshment areas which serve alcohol. 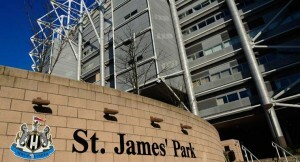 The atmosphere in St James’ Park can be electric and is one of the best stadiums in the country. The Geordies are knowledgeable about their football, and are friendly and helpful. Combine it with a night on the Toon, and you’ll be guaranteed a good trip. If you’re going to do a footy weekend, there’s no better place than Newcastle, and a good number of hotels makes this possible. Loads of restaurants, pubs and clubs make Newcastle a party destination, where you’re bound to encounter countless hen and stag parties. You’ll find hotels near the stadium, as well as many in the city centre. The Club offers stadium tours at 11:30, 12:30 and 14:30. On matchdays only at 10:30. Cost is £15, Concessions £12, Under u-16 £8, u-5 Free. Tours must be pre-booked by calling 0844 372 1892; entry to the club museum is also included. Playhouse Whitley Bay (NE26 1LZ) has Showaddywaddy on the Friday night, tickets are £22. Also on that night at Wylam Brewery, Palace of Arts (NE2 4PZ) it’s Transatlantic Bowie, a tribute to his music with tickets at £17.50. Every day at the Centre for Life at the Science Centre (NE1 4EP), it’s Polar Express Journey to the North Pole. The 4D ride is a six minute film and is included in the entrance price of £13, £7.50 for children and £10 for concessions, U4s entry is free. Family tickets are £34. The Newcastle Metro Radio Arena (NE4 7NA) has Arenacross on the night of the game, a mix of world-class indoor Motocross racing, high-flying Freestyle Motocross and a show with lights, lasers, pyro and a pumping soundtrack. Tickets are £33-£55.55, and child prices of £20.55-£44.85. Family tickets are available. The ground is smack in the middle of the city. There are plenty of pubs to choose from, but most away fans use pubs around the train station. The ‘Head Of Steam’ (NE1 5EN) and ‘O’Neills’ (NE1 5DF) are recommended, but some will only admit fans if colours are covered and none admit children. Nearby is ‘The Union Rooms’ (NE1 1TT), formerly a Wetherspoons pub. I’ve had meals and a good few pints in there, and it’s massive, and a good place. There’s the ‘Bodega’ on Westgate Road (NE1 4AG); it’s in the CAMRA Good Beer Guide and has a friendly atmosphere. Closer to the ground and round the corner from China Town is ‘The Bridge Tavern’ (NE1 5SE). Unless you arrive very early and have no colours you’re unlikely to get in. For parking, avoid the city centre at all costs. There are loads of pay and display car parks around, including the Royal Victoria Infirmary (NE1 4LP). Parking here is in a multi storey and allows a quick getaway after the game. You can head for Heworth, near Gateshead adjacent to the A184. It has a Metro Station and a long term car park where you can park your car for £1.40, then catch the metro to the stadium. One train to get you there before kick-off leaving Swansea at 05:59 arriving12:32. No trains come back to Swansea that night. The train station is half a mile from the ground and takes 10 minutes to walk. Come out of the station, cross the zebra crossings and go up Pink Lane. Cross Westgate Road, go up Bath Lane with the old city walls on your right. Turn right onto Stowell Street (Chinatown). At the end, bear left up St Andrews Street by Rosie’s Bar, under the ornate Chinese arch then left up Gallowgate. The ground is on the right. Newcastle Airport is 7 miles from the city centre, the easiest way in is by Metro. The airport has a Metro station next to the terminal. Trains run every 12 minutes with journey time of 23 minutes, £3.10 for a single or £4.70 for unlimited travel for one day. Flights going up Friday and back on the Sunday are Flybe from Cardiff at £168 and Easyjet from Bristol at £147 – both prices at time of writing.